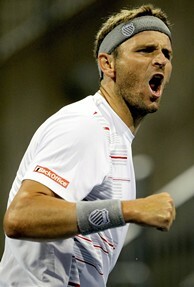 MONTREAL, QC - AUGUST 11: Mardy Fish celebrates match point against Ernests Gulbis of Latvia during the Rogers Cup. MONTREAL (AP) -- Mardy Fish defeated Stanislas Wawrinka 6-3, 6-7 (8), 6-0 Friday to advance to the semifinals of the Rogers Cup. The sixth-seeded Fish dropped an error-filled second set to the 14th-seeded Wawrinka. It went to a tiebreaker after neither player was able to hold service over the final four games. Fish cruised through the final set to reach his fifth tournament semifinal of the year. It's a big improvement for Fish at the Rogers Cup, where he didn't win a match in previous visits in 2003 and 2008. He will face the Serbia's Janko Tipsarevic, who ousted seventh-seeded Tomas Berdych 6-4, 6-4 for his third victory in three meetings against the Czech player. Fish has won three of the four meetings against Tipsarevic. It will be a first trip to the semifinals of a Masters Series event for the 27-year-old Tipsarevic, whose performance this week will also put him into the top 20 of the world rankings for the first time. Tipsarevic is currently ranked 24th. Later today, top-ranked Novak Djokovic will face Gael Monfils, and Jo-Wilfried Tsonga will play Nicolas Almagro, with the winners advancing to the other semifinal on Saturday. Former world No. 1s Rafael Nadal and Roger Federer and defending champion Andy Murray were knocked out in earlier rounds. The 29-year-old Fish, whose career turned around after knee surgery and a new dedication to fitness two years ago, has won 10 of his last 11 matches, including a win last month in Atlanta and a loss in the final at Los Angeles two weeks ago. He has already passed Andy Roddick as the top-ranked American player, a status he will almost certainly take into the U.S. Open, which begins in two weeks. "But (Roddick) went into the U.S. Open as the leading American for 10 straight years, so just because I go in one year ... you know what I mean?'' Fish said. "I've got too much respect for him.